I'll use any excuse to wear a scarf - this works well in the autumn/winter months and the chillier part of spring and although I have dozens upon dozens of them I'm fairly lacking in the summery scarves area and treated myself to this light and floaty one a couple of months ago while it was on sale in a local boutique. Then, me being me, I promptly lost it and had forgotten I owned it until I opened the bottom drawer of my bureau and there it was wrapped around my little Wedgwood vase, no idea what the thought process was in putting it there but it was great to have the 'new scarf' feeling all over again! It's fairly difficult to showcase a scarf on a stool (oh for a beautiful vintage dress form) but there are three different fabrics stretching the entire length of it, the bright florals around the same width as a wide ribbon, a super light grey muslin type fabric with a thread of little crochet circles then a pretty light blue lace. I can't help thinking it would be really striking to use a similar approach of three different light and floaty fabrics all with different textures to make curtains - it might be time to bug T's Mum for the sewing-machine-driving lessons I've been thinking about! Jem that is just gorgeous! 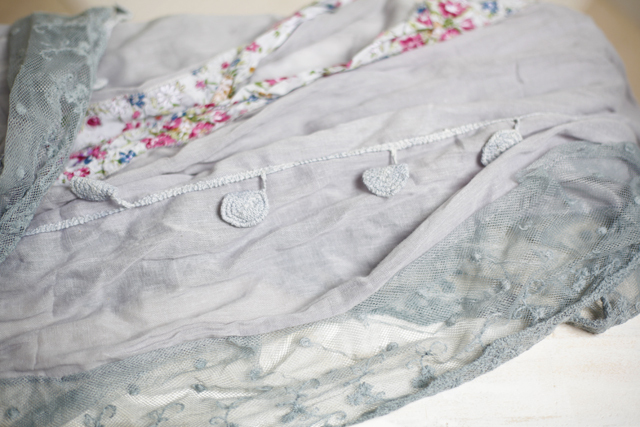 I can't wear scarves as I don't like things around my neck but that one looks lovely enough to use for a multitude of things or just to have on display! So pretty, congrats on a lovely rediscovered treasure! Go on, get your "L" plates Jem, then you can whip up a scarf for every day of the week! And I love your curtain idea too. 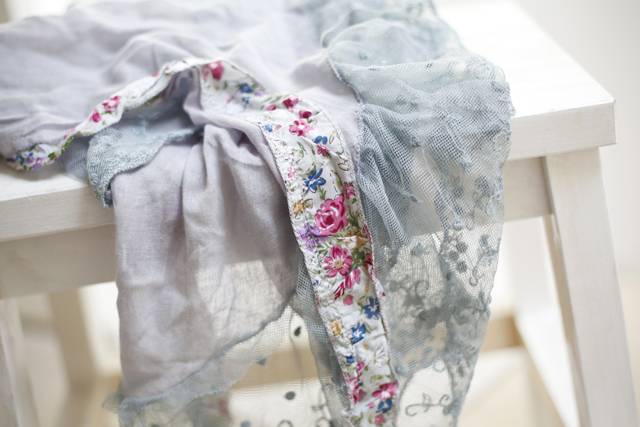 I like the idea of a nice plain linen with a lovely border 3/4 of the way down. A beauty, I think I could cope with such a light scarf around my neck. I have a short neck and don't feel comfortable with a scarf on, but I love how they look. Make sure you get those lessons, you'd make an excellent pupil I reckon, and we'd love to see your creations. Very pretty scarf. I’ve got a drawerful that I hardly ever wear, now I live in the land of perpetual summer. I keep taking them out looking at them and wondering what crafty thing I could do with them - patchwork floaty curtains perhaps? I'm so glad you visited me today!! Your scarf is AWESOME!! Such a beauty to see, and amazing to wear!! 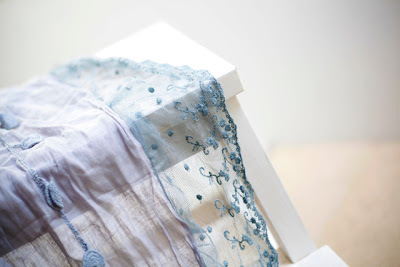 Such a pretty scarf! I only own outdoor winter scarves. Good luck with the sewing lessons! Gorgeous scarf, love the design. 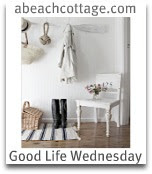 Thanks for sharing at Beach Cottage Good Life Wednesdays. Oh, that's so nice....I love scarves. Don't you find though that some women can throw one on and look amazing whilst others (like me, for example) just look like they're protecting a sore throat?! Don't you just love it when you find something or rediscover something you've forgotten? That's a gorgeous scarf!! You should definitely get those sewing lessons! !